MYZONE® is a popular chest strap and monitoring system that transmits heart rate, calories and effort in real time to a live display and wirelessly uploads that data to your MYZONE® at ClubSport San Ramon. MYZONE provides live feedback during your workout by displaying personalized, color-coded guidance on your effort, heart rate, calories burnt and points! MYZONE uses color-coded heart rate zones to establish percentage of maximum effort (intensity) based on heart rate. Every minute of effort above 50% will earn you MEPs. As a MYZONE user, you can track how your effort is helping you achieve your goals. Your personalized account will track improvements in weight, body fat, muscle mass and many other vital stats giving you ongoing motivation. Your FREE app is an easy way for you to review all of your MYZONE account activity in the palm of your hand. Using your smart phone, you can monitor your activity calendar, workout graphs, and challenges. You can even upload personal before and after shots and keep a food diary. Available on Google Play and the Apple App Store. Q: Can I use my MYZONE® Physical Activity Belt outside of ClubSport San Ramon (my MYZONE® facility)? A: Yes. One of the unique features of the MYZONE® Physical Activity Belt is that it will record any concerted physical activity that you undertake, anywhere. Once your workbook data is automatically uploaded to your account it clears the MYZONE® Physical Activity Belt memory to enable you to store more activity data. Q: How does my workout data upload to my MYZONE® account? A: Your personal workout data is wirelessly updated to your MYZONE® account provided you are within a 10 foot range of the MYZONE® Console. ** If you are in a CSSR cycle class, your information is already being uploaded. You do not need to upload at the console downstairs. Upload Tip: You can also place your thumbs on the rubber sensors to activate your belt in order to upload without putting your belt on. Q: Where is the MYZONE® Console at ClubSport San Ramon? A: The MYZONE® Console is downstairs, to the left of the front desk. Q: Do I need to stand in front of the MYZONE® Console before my workout? A: No. You only need to upload after your workout. Q: How many hours worth of data will my MYZONE® Physical Activity Belt store before I have to upload it to the ClubSport San Ramon MYZONE® Console? 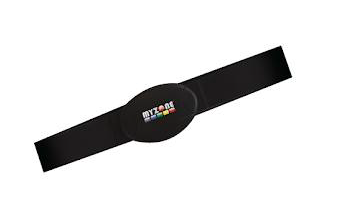 A: The MYZONE® Physical Activity belt has a unique MYZONE® memory that allows approximately 15 hours of activity (this will vary depending on exercise intensity). It is recommended that you upload your activities as often as possible. Q: Can I use my MYZONE® Physical Activity Belt with gym equipment and other heart rate watches? A: Yes. The MYZONE® Physical Activity Belt has an analogue 5.3 KHz frequency radio which is compatible with most brands of traditional cardiovascular equipment. This will also allow connectivity with most analogue heart rate watches.